Getting a subject for a photo is hard but not when you are surrounded by lazy and sleepy cats! I had been wanting to have a cat like Garfield when I was small, however, due to my mom and brother's asthma issues, we can't have one. Well, my younger brother had brought a cat before and it ended up in the forest because my mom can't really survive with cats or any animals with fur like dogs as well. So, we do can get a cat but it can't get into the house, it shall live in the garden only, far from our main house. So when I came to Oslob, my boyfriend's place, it is just fascinating to be just around with cats. These are cats which they didn't adopt, they have just come there pretended to be part of the family. Teehee. I know you know what i mean. So anyway, they are just eating those left overs, they aren't being around always, they come by breakfast, lunch and dinner time only. And what they do after eating? Of course they get some good sleep! I was able to take a lot of shots for those cats! 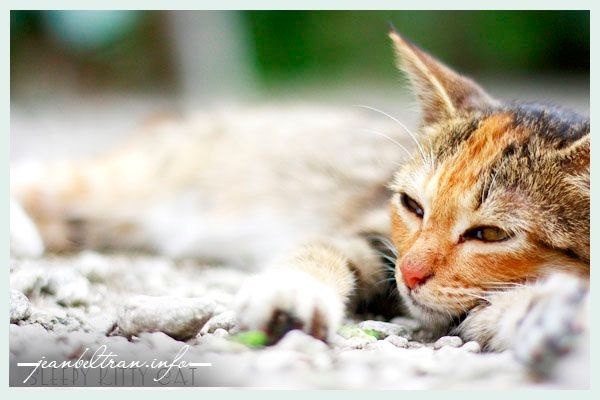 This one is a young cat which had actually learned the art of sleeping right after eating.